5 Must-Know Trade Show Secrets | Displays and Exhibits, Inc.
You may have the trade show basics down, but to truly get the most out of a trade show trip, there’s a few secrets that help squeeze out a little more promise from your experience. Put aside what you know about selling on the trade show, these tricks help you succeed even further. Anyone can take on a trade show and measure their results by sales made, contacts received and a number of other data-minded successes. But there are multiple secrets to maximizing a trade show effort that don’t necessarily tie directly into the sales of a given trip. These preparatory suggestions can help your brand walk away from a day or weekend trade show with important feedback, connections and business growth. Your brand is going to be flanked by a number of competitors packed into a trade show’s conference or exhibition hall. Whether your company is a trade show rookie or a veteran industry insider, knowing what you’re up against can be amazing preparation for building up a successful booth and experience. Analyzing similarities and differences between your brand and the competition can lead to insightful information that can be used to help your booth become a standout. Highlighting what makes your memorable and unique (instead of just how you compete alongside similar brands) is a great way to keep from blending in when surrounded by your competitors. Dare to be different. While a trade show may be industry-centric, not every brand is pushing the same product or even pursuing the same type of customers. There are a number of ties that can be made on the trade show floor that could lead to innovative collaborations and exciting projects. Having allies within the industry (and a few great recommendations) is important when you’re battling with a handful of competitors that do promote the same type of products and offerings. Part of the focus on making your brand a standout stems from differentiating yourself from competitors, but another focus should remain on the potential customers themselves. Providing them with an intriguing overall booth experience can work wonders on your sales numbers at–and after– the trade show. The best booths understand that creating a great presentation and earning a great reputation can be just as promising as sales on the initial floor. The best relationships are formed organically and genuinely, thanks to an authentic interest in what makes your business (and booth) compelling. Plenty of business is done in person and after the trade show, but don’t stress to be so limited in traditional sales or relationship building opportunities. Trade shows usually span a number of activities and days, so take every chance to connect with potential customers and clients wherever the opportunity may lay. You never know who you’ll meet at check-in, lunch or the after-party. As much as you may be in rivalries with your competitors and industry colleagues, there’s no denying that if they’re keeping up with your business, they’re talented. Use your trade show experience to soak in and absorb as much new and exciting information as possible. If another brand and booth is doing something unexpected and innovative, don’t get discouraged by it–get inspired. Some of the best ideas can come out of being challenged and feeling the pressure of excellence around you. 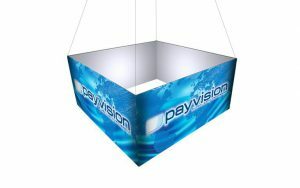 Displays & Exhibits is a one-stop shop for portable trade show displays and branding accessories. We offer a wide selection of trade show products, including pop up displays, slatwall displays, banner stands, counters and interactive media kiosks, hanging signs and much more! We are committed to providing superior customer service and the highest quality products to meet every marketing need. Displays & Exhibits is a division of Absolute Exhibits. © Absolute Exhibits, Inc. All Rights Reserved.